Jean Michel Jarre - the complete Oxygene trilogy. This guy is way ahead of his time. Pieces in a Modern Style - a reworking of some classical pieces using synthesizers - one of the prized possessions in my CD collection. Must get the follow up album sometime. Music for Films - Brian Eno - a strange collection of short pieces that defy logic and should not really work in an album setting - but it does. And very well too. Oxygene 3 - the critics panned it but the more I listen to this album the more I hear on it. It's quite subtle & seductive. don't fall off the chair Jerome! sorry MH, I admit it, im getting weird! OK CH - I am just picking myself up off the floor right now. 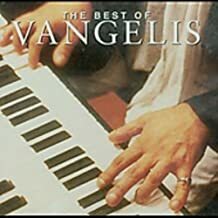 I find Vangelis can be either terrible or brilliant. Some of his earlier experimental stuff can be quite hard to swallow at times. But his later stuff seems to be leaning more towards 'orchestral electronica' and those albums I really like. There's an album called 'Reprise' - a kind of 'best of' album which I really like and listen to quite a bit. I'm into some old Boogie-Woogie tunes right now. Soooo hot! Steve Jolliffe - couple of albums on Spotify and YouTube. Haven't listened to anything of his before - he was in a band called the Joint, with Rick Davies, pre Supertramp, then moved on to tour with Tangerine Dream for a bit - recorded one album with them, Cyclone, followed that with Steamhammer, and additionally had his own fairly prolific solo career. He holds the distinction of being the only person accepted to study at the Berlin Konservatorium who was unable to read music (at the time - that might have changed). I had been going to put him in the BOTD thread but ran out of time and oomph so have just ended up exploring his stuff instead, and there is plenty of that! I'm not at all surprised that he's attained cult status, albeit not commercially - then again, if he had, I probably wouldn't want to hear his music! I like this - old school electronica with some instruments (he's a bit of a wind guru, I think, of the brass variety) - a bit new agey and latterly, ambient. Interesting. And this is from Escape. I'd have chosen "Red Witch" but YT denies access to the clip in my country, dammit. Now I'm going to listen to Alien again, Warrior, which I haven't heard in full yet, and Zanzi.